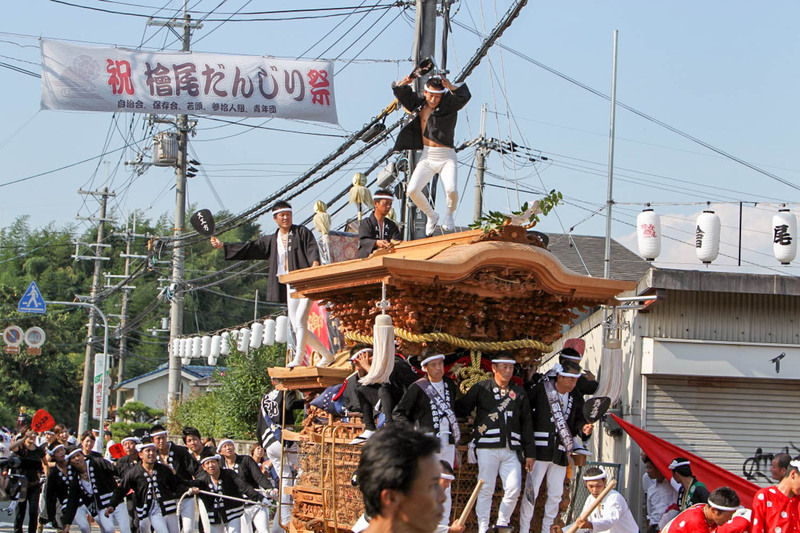 Speaking of Danjiri, also "Kishiwada" is most famous and large scale, but in fact, in addition to Kishiwada, can see at Sakai-city, Hyogo-Pref, Nara-Pref etc, Kansai wide area. 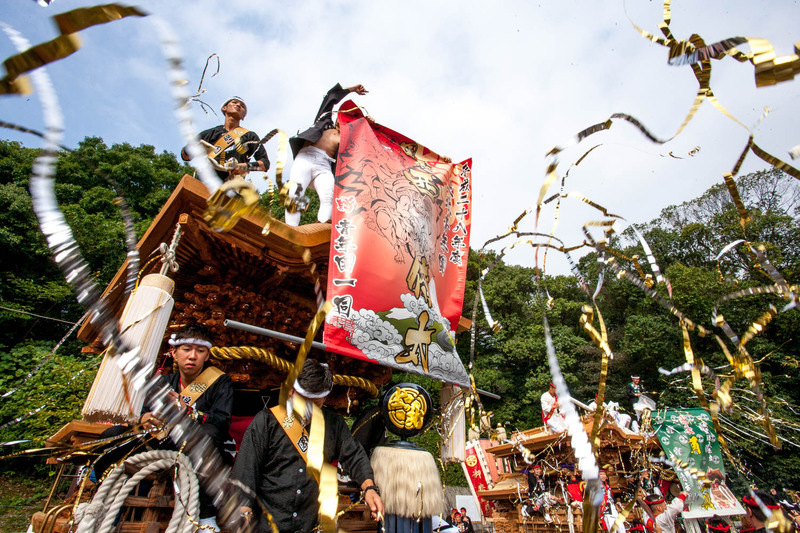 Historically, it is said Danjiri is begun from Edo era. 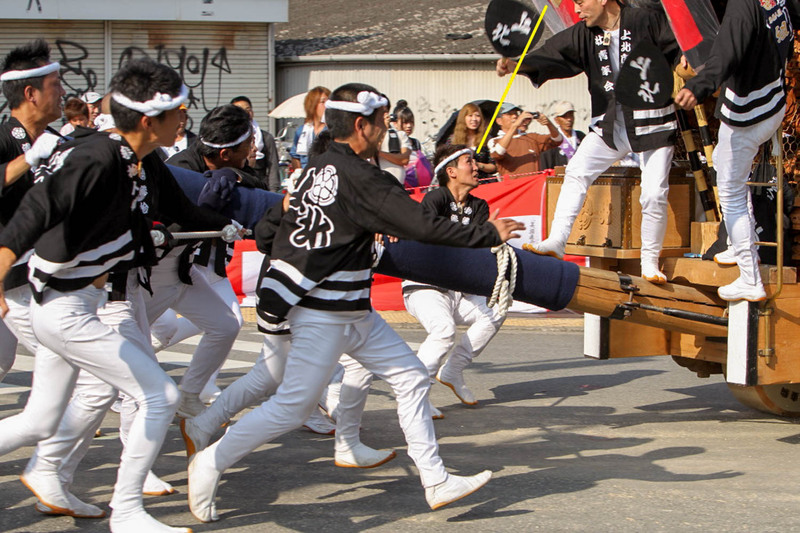 However, there are some theories of its origin, in there, is also a theory that Sakai is the birthplace of Danjiri. 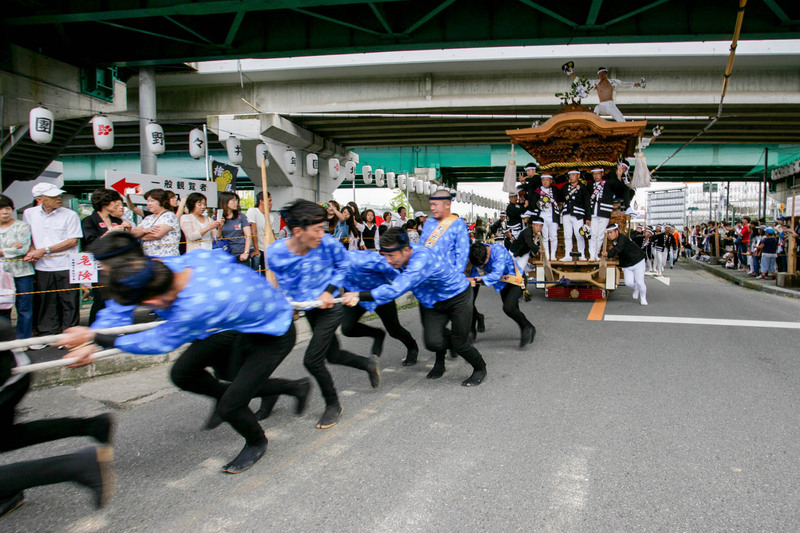 Two days of the first Saturday and Sunday of every October, "Mifuku Union Danjiri festival" will be held in neighborhood of Senboku New Town of Osaka Sakai City. 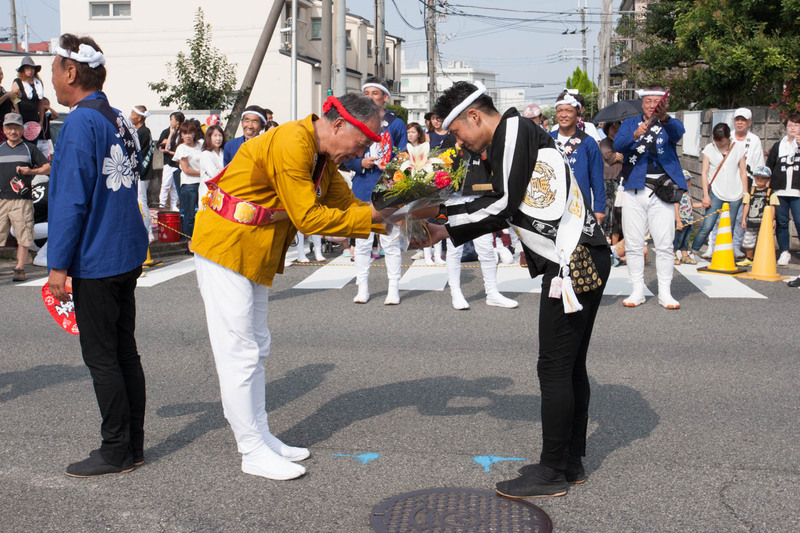 This photo is a look of "Yarimawashi" In front of Mitami shrine that is "Miyairi shrine" of Mikitai-district Kamikita Town. 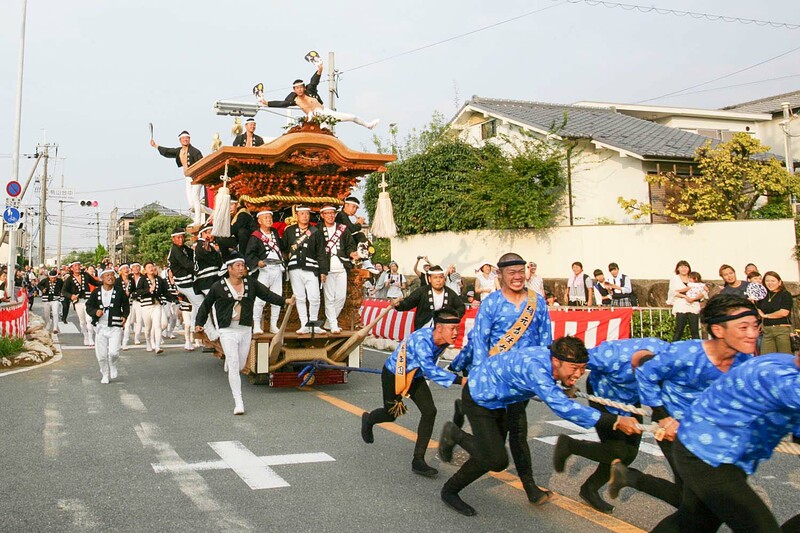 Sakai-city "Mifuku Union Danjiri Festival" will be held over two days of the first Saturday and Sunday of every October. 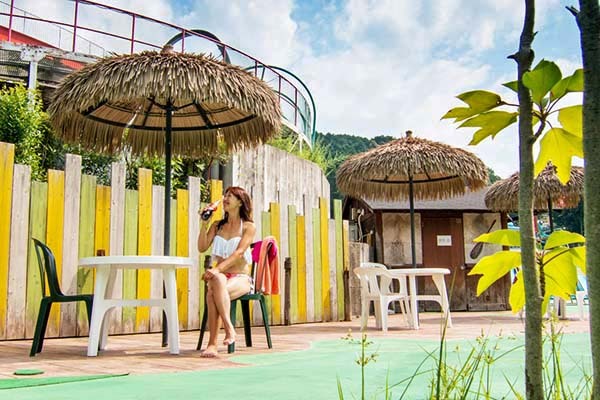 It have been that First day is "Yoimiya", and Second day is "Honmiya", and respectively there are attractions such as the following. 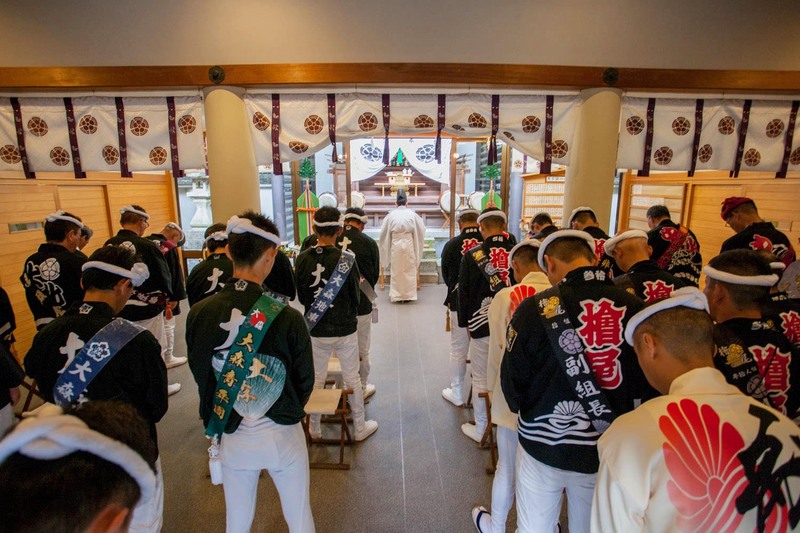 Gathered together 7 towns of Mifuku Union, and repeat "Yarimawashi" earnestly over two hours. ・Bus: Ride the 6 series or Toku6 series bus at No.2 or No.5 bus stop, and get off at "Takahashi" bus stop. ・Taxi: There is stand in South side rotary, say "Takahashi Kousaten". 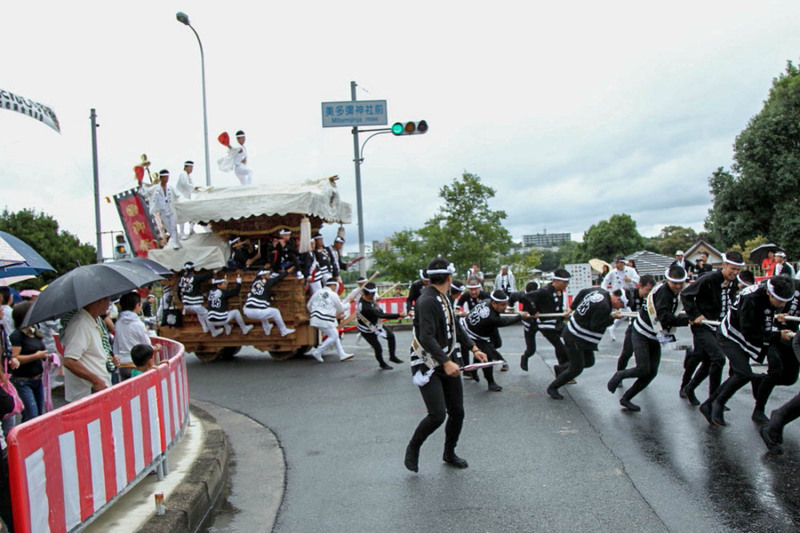 Viewing area of the general public gallery has been designated strictly, because the "Yarimawashi" is inherently dangerous. Enjoy observe the manners and traffic rules. 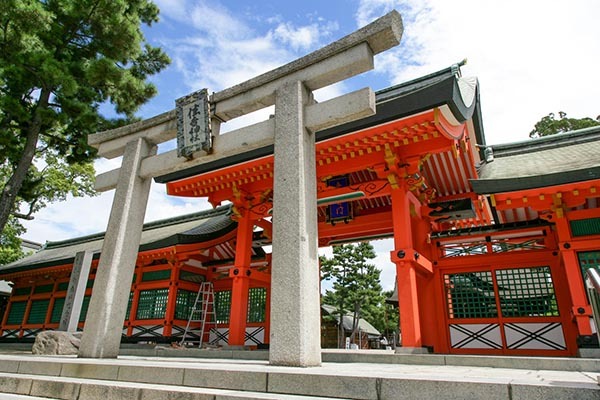 In Mitami Shrine, Miyairi of Mikita-4-towns of Mifuku Union is done. ・Bus: Ride the 6 series or Toku6 series bus at No.2 bus stop, and get off at "Mikita" bus stop. 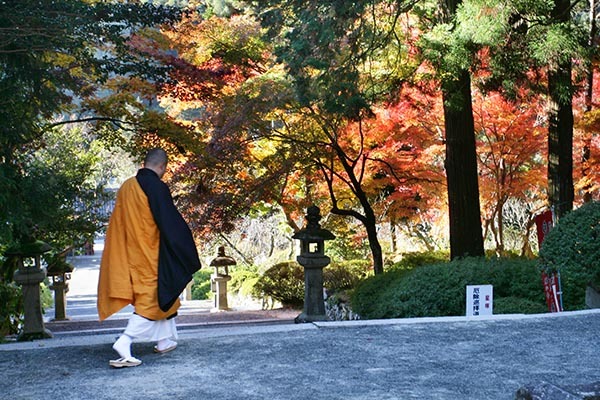 ・Bus: Ride the 10 series bus at No.5 bus stop, and get off at "Shiroyamadai-icho" bus stop. ・Taxi: There is stand in around the station, say "Mitami Jinjya". Mustering the Mifuku Union 7 towns and Niwadani district 5 towns. 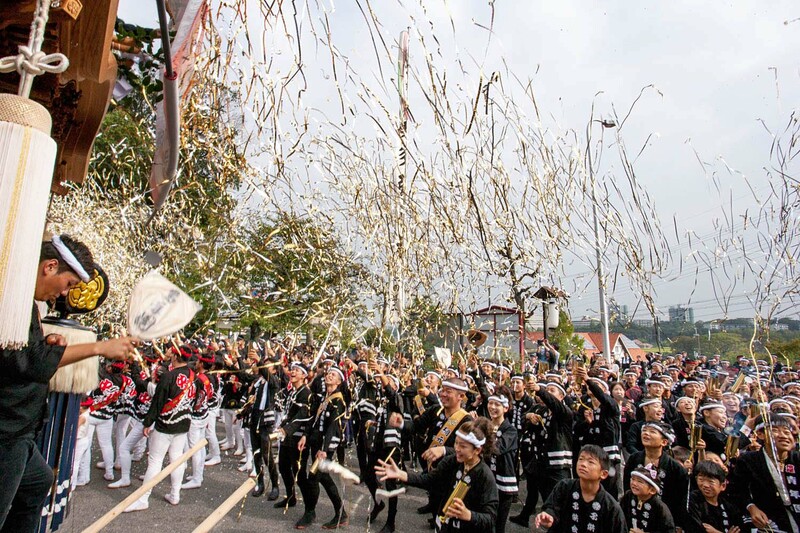 "Minami Sakai coalition" of all 12 the towns, is unfold heroic performance. 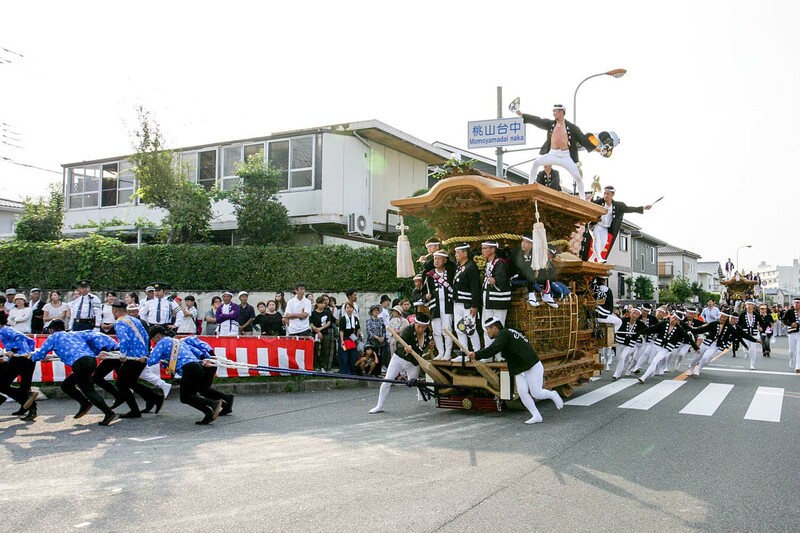 ・Bus: Ride the 7 series bus at No.5 bus stop, and get off at "Momoyamadai-icho" bus stop. 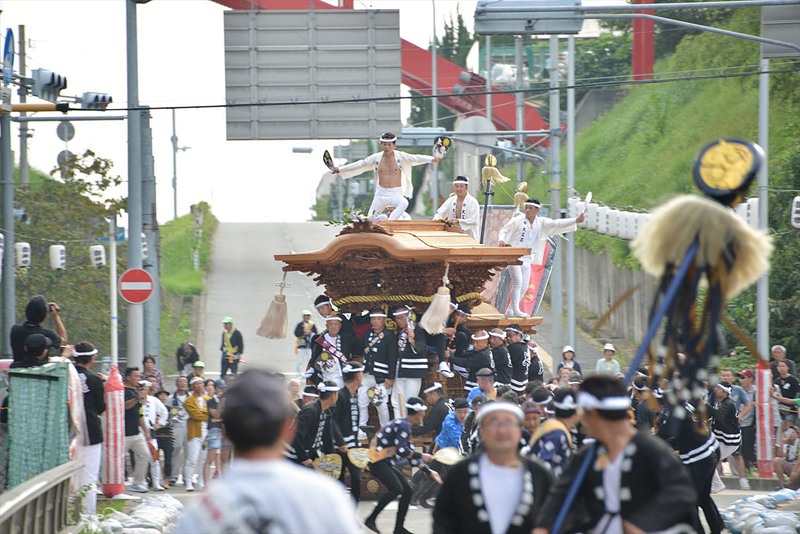 Danjiri is mass of wood that total weight approximately 4t, and it requires cooperation of large number of human, to move. 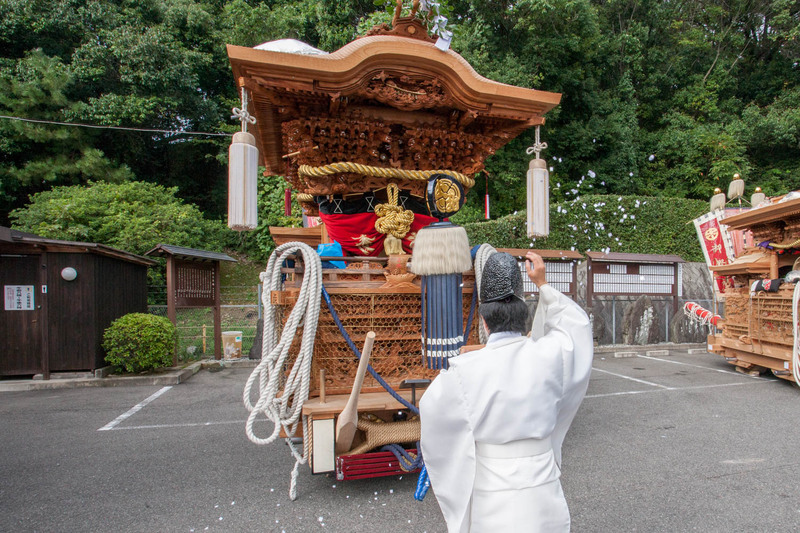 In order to move the Danjiri properly, becoming very important that cooperation of each of these departments. 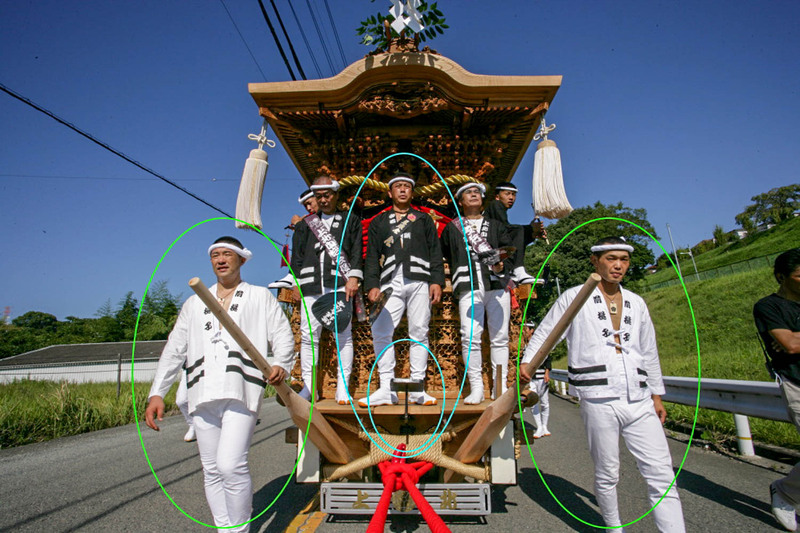 First of all, the role of each department of Danjiri Move, has become as follows in order from the front. 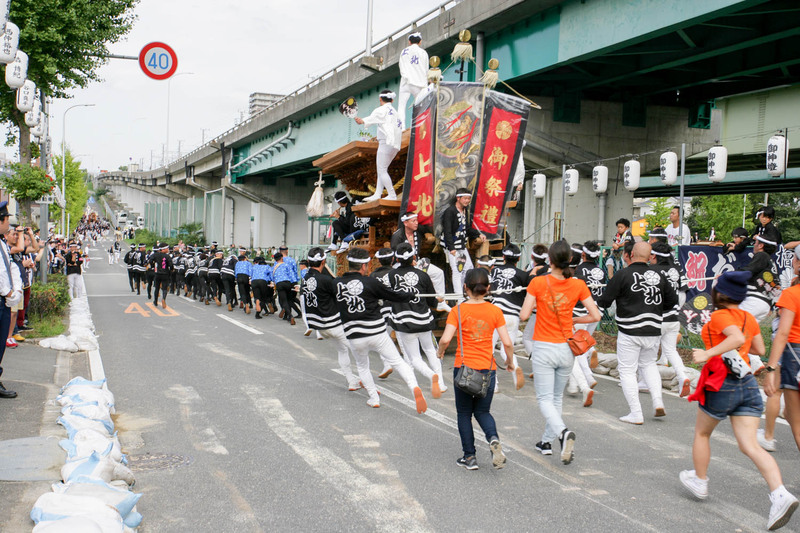 Basically Youth League is in charge to the driving force to move Danjiri. 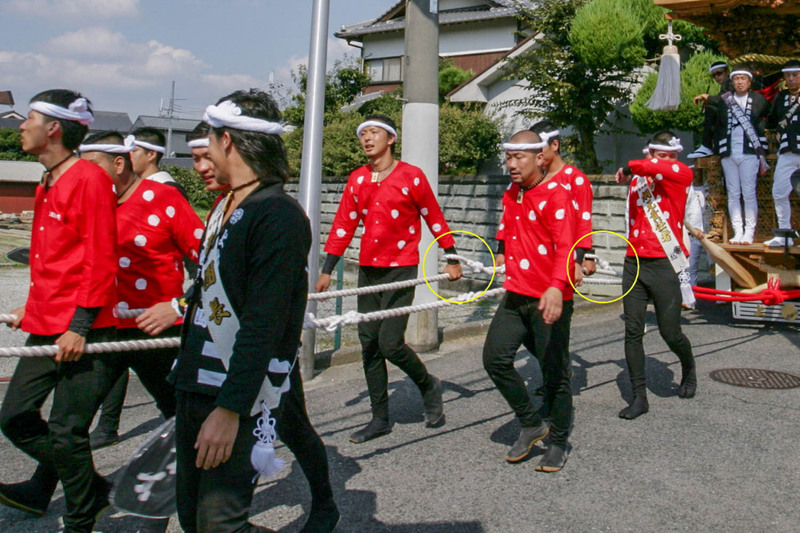 In fact, it says "Tsunasaki" near the beginning of rope, and near the mid-called "Tsunanaka", Tsunasaki is stretched so as not slacken the rope, Tsunanaka is pull the rope in full force. They are engine if likened to a car. 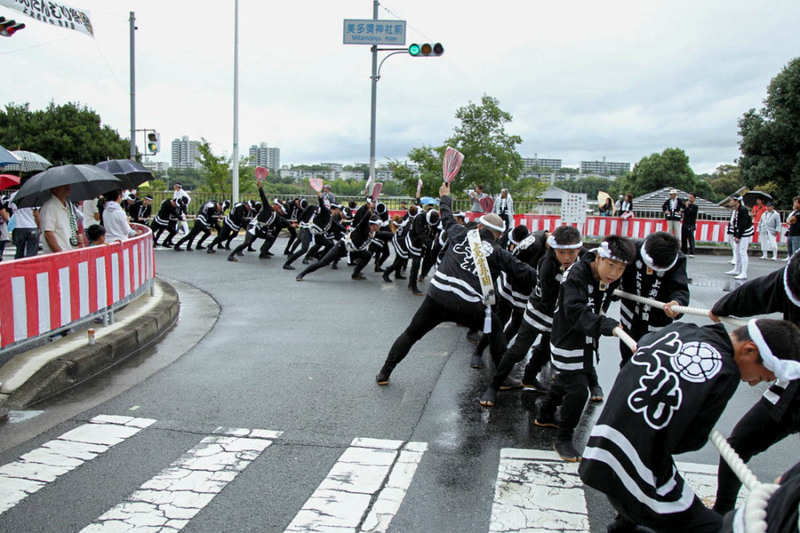 They position close to the Danjiri among the Tsuna, charge by the seniors among the Youth League. 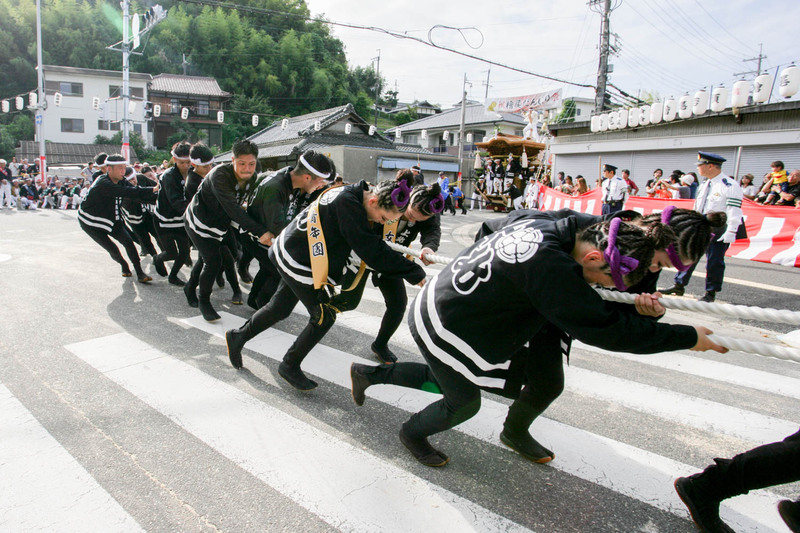 Using the force to pull the Danjiri of Tsunasaki and Tsunanaka, it is important departments to involved also in the change of direction of Danjiri of Yarimawashi. They are danger departments that applied large force on actual traveling, and Tsunamoto part is only attached the wheel for through the wrist . Basically Wakagashira in charge and one at a time to the left and right. 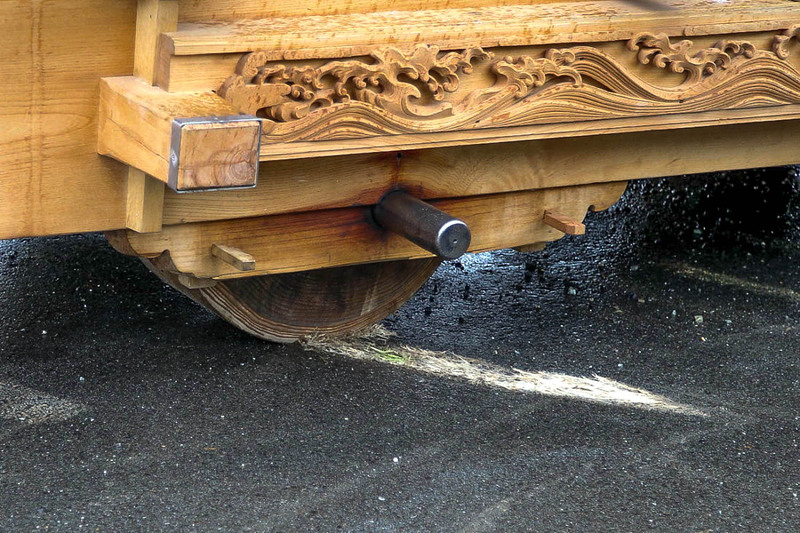 By be bitten the lever of wooden to the front wheels of Danjiri, in the case of only left or only right it role to change the direction of Danjiri, and in the case of both simultaneous plays the role of a brake. 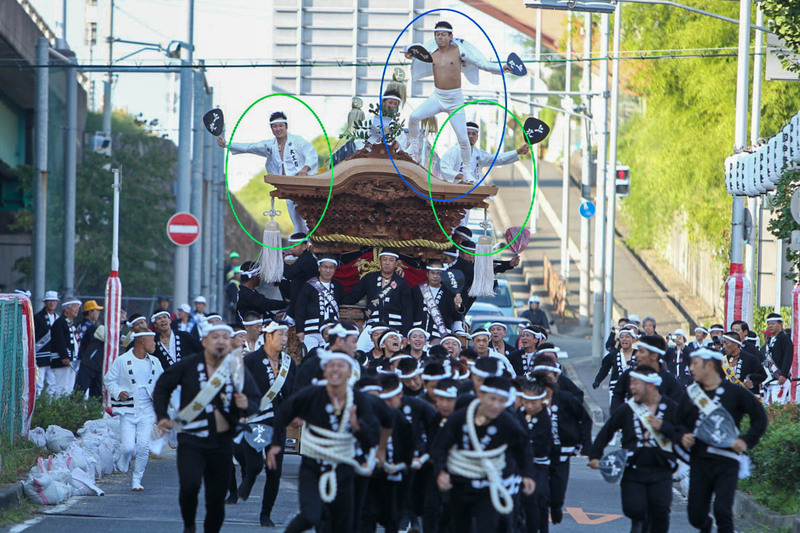 In star it should be called "face" of each town Danjiri, also plays the role to take the timing of the change in direction of Yarimawashi. 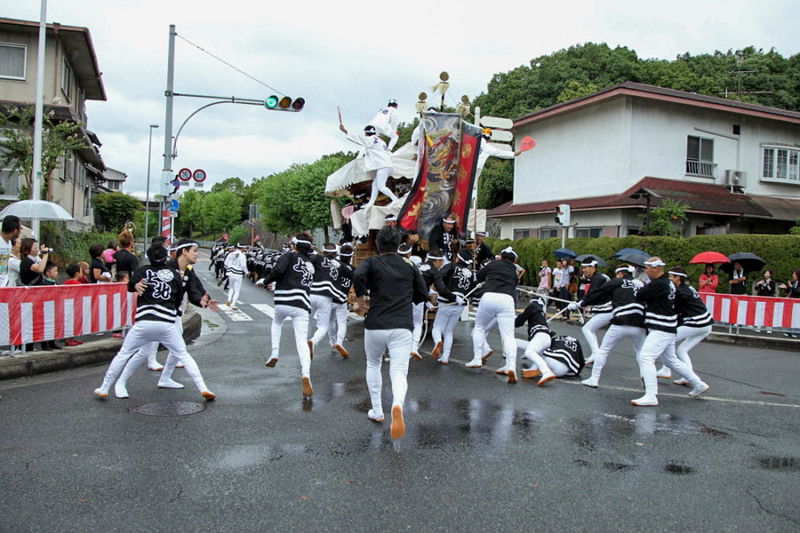 In one at a time to the left and right, the role of transmitting an indication of Ooyane to the rear lever members, and responsible for controlling the direction of Danjiri. They are direction indicator if likened to a car. It is very important role that must be transmitted to the rear lever members to accurately determine the timing and degree of the change of direction. 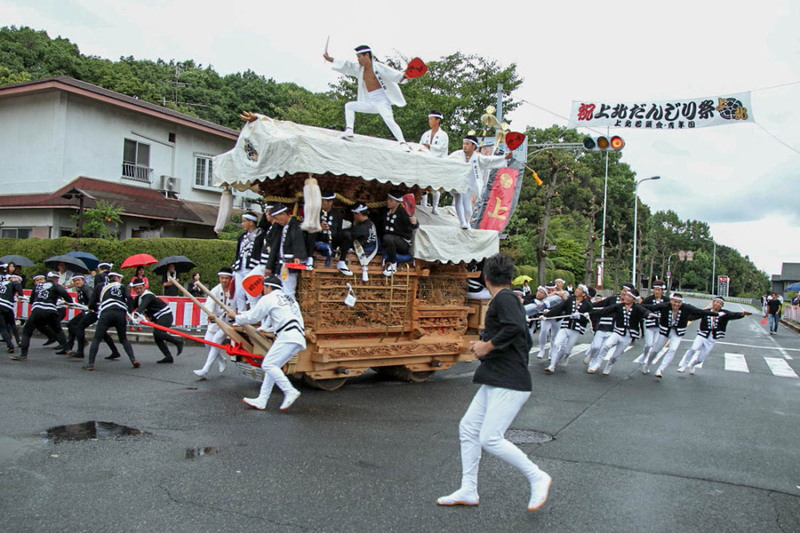 They are handle if likened to a car, and will be responsible for changing the direction of Danjiri. Maeteko is making the opportunity of turnaround, and Ushirodeko will be main force of the change of direction. 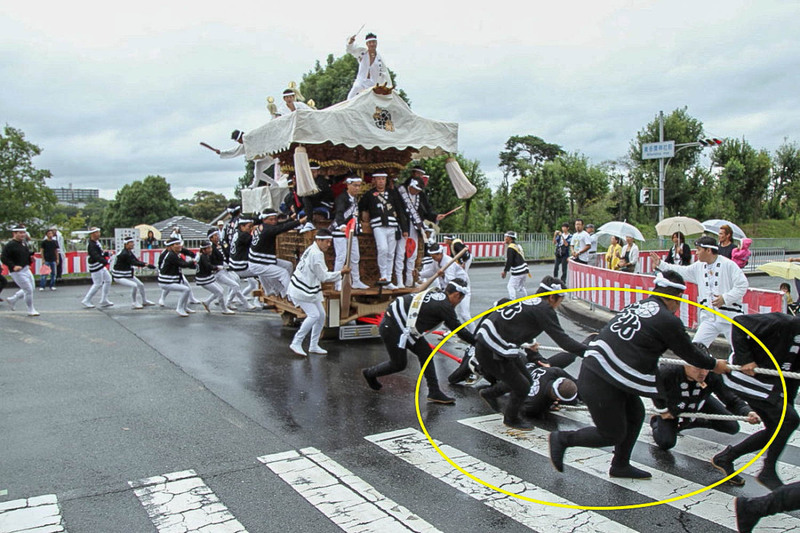 Basically Wakagasira in charge, they are department that most high probability to receive injuries, when the sudden turning of Yarimawashi. 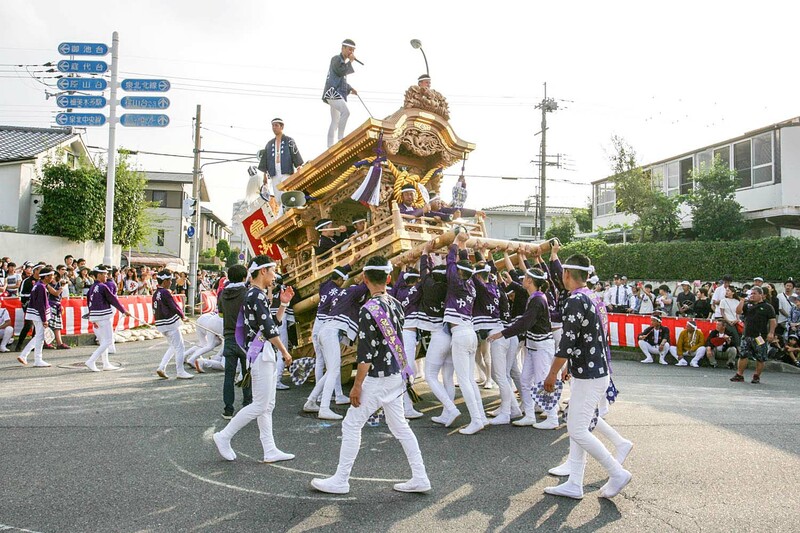 In, because there is no handle on the Danjiri itself, if leave alone without doing anything, it is the mass of the 4t of only single-mindedly straight. 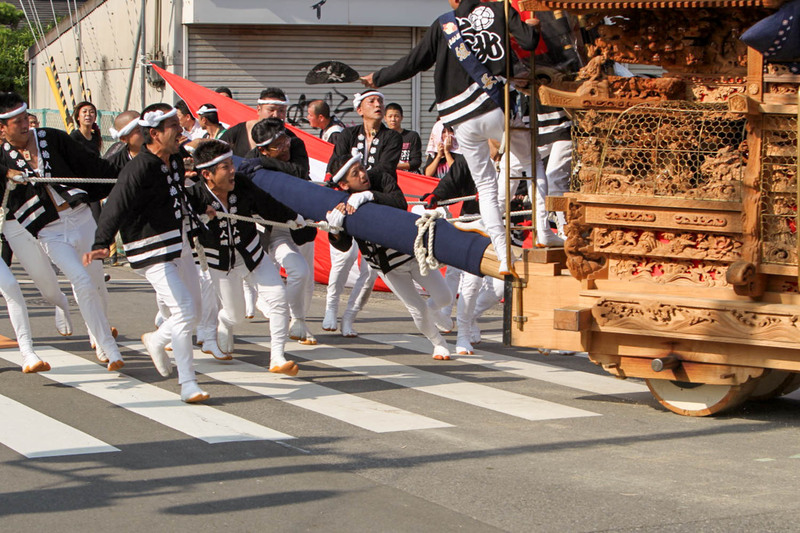 Wheel of Danjiri will quickly fall apart. Ooyane is jump move, It takes the timing of the change in direction. 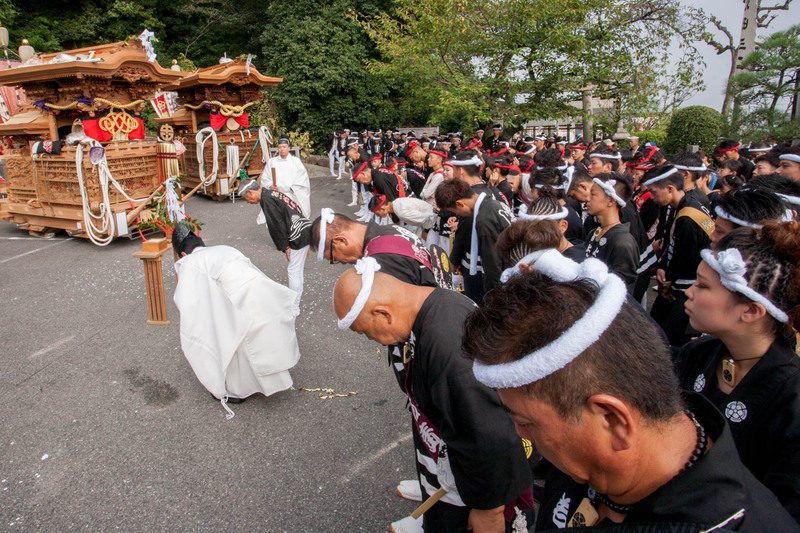 At this moment, the members of Ushirodeko is not directly visible Ooyane, they see a sign of Koyane. Then Koyane sends a signal to Ushirodeko, at nearly simultaneous timing, the Maeteko (left in charge only because the left corner) will bite the lever. 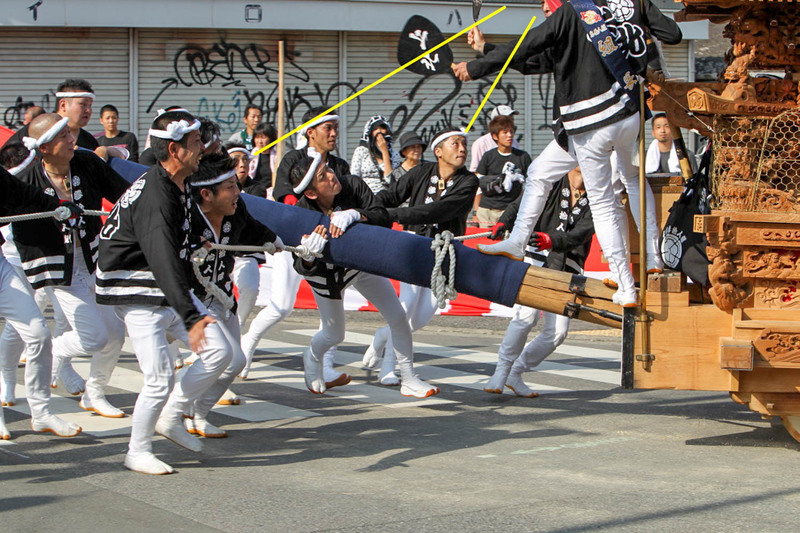 Ushirodeko members divert at full power, At this moment, those who hold the ends of the rope on other side, they have to look up at the always Koyane while applying the weight in the back. 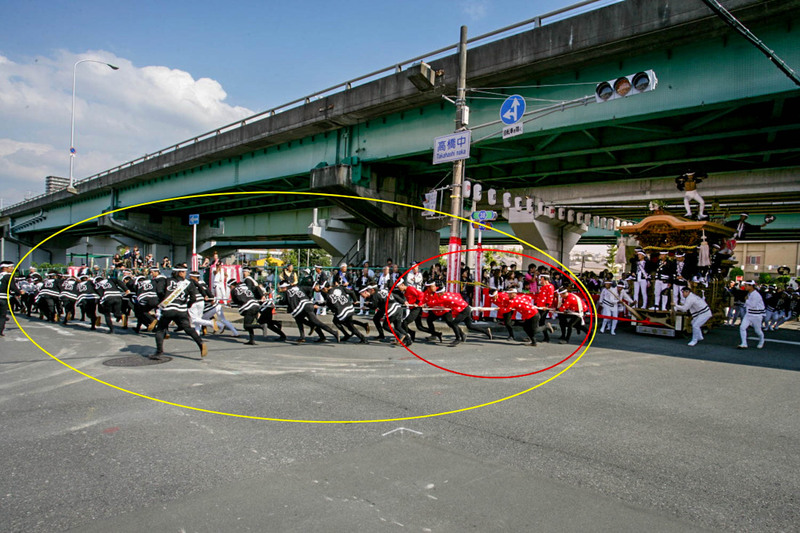 In, at the timing when the direction of Danjiri is changed 90 degrees, Koyane of the left and right both put out a signal to the Ushirodeko at the same time, Ushirodeko will against the counter at that moment, prevent the Danjiri is too rotated more than 90 degrees. This collaboration, in fact because it will be a time lag to be transmitted the signal as "Ooyane >> Koyane >> Ushirodeko", Ooyane should take the timing on which it is also taken into account. 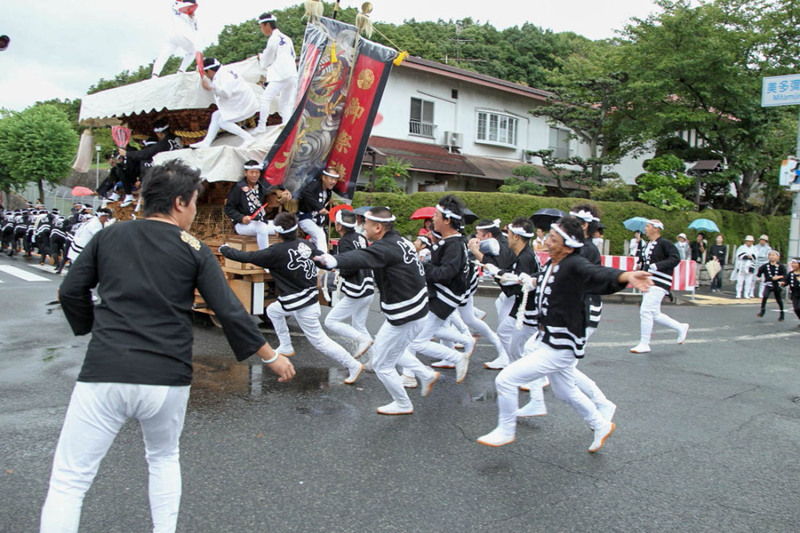 If all members are grasp well the rhythm of this transfer, success rate of Yarimawashi is also high. 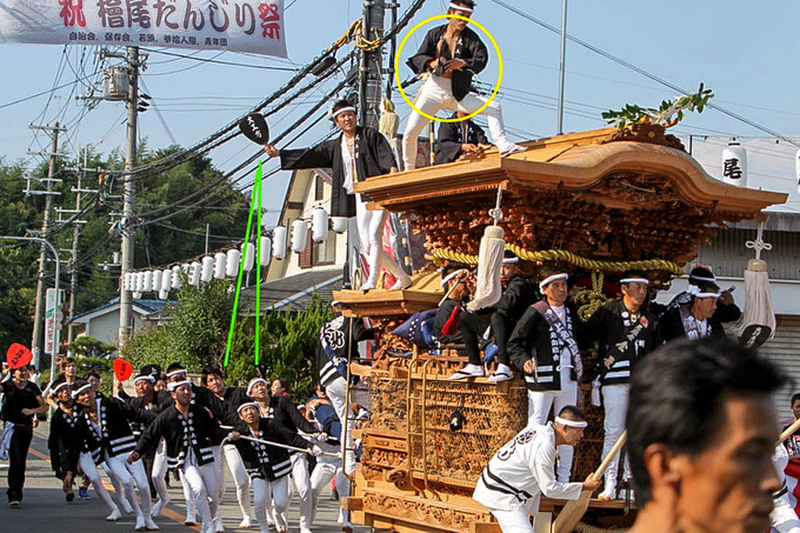 But in fact, almost none that directed to Danjiri in the direction on the first attempt at Yarimawashi, in many cases, the rotation angle will too many or not enough. In that case must do fine-tune the direction, when that happens, is asked the the true value of situation judgment of Koyane. Every once, it is required time for members of Ushirodeko are adjust the posture. For that reason, if Koyane would put a sign in a hurry that state that posture of Ushirodeko members is not well-equipped, not to change direction that not match the timing of Ushirodeko. 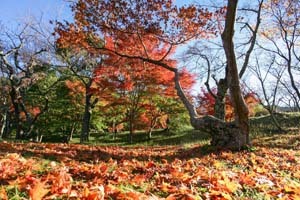 And at the time which could not be fixed in the first adjustment, it fails becomes decisive. 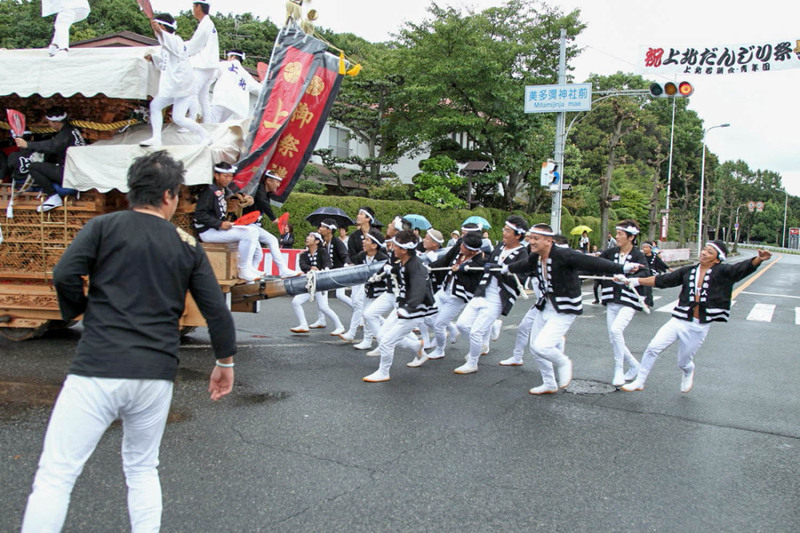 In addition, Yarimawashi is always with the dangerous, In particular, members of Ushirozako is, The movement speed becomes concentrically fast as a backward person, At the moment when Danjiri wheel regained a grip, one arm costs one's weight that increased inertia, As a result it will be constantly blown away. 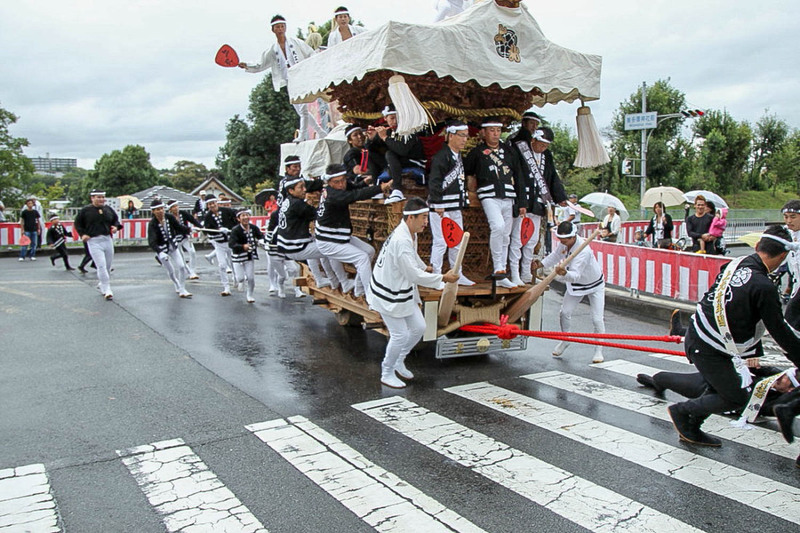 The sliding degree of the wheel is changed with road surface state, so, nearly half of them of the Ushirodeko member may be flung away in some cases at this moment. 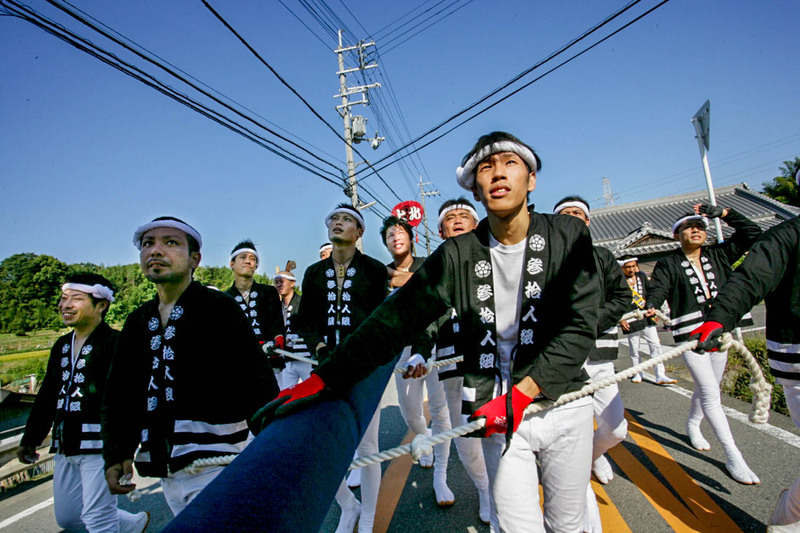 In, Tsuna in charge of the front is, From a state in which stretched the "arc" in hight strength with rope, it will begin pulling at a stretch. 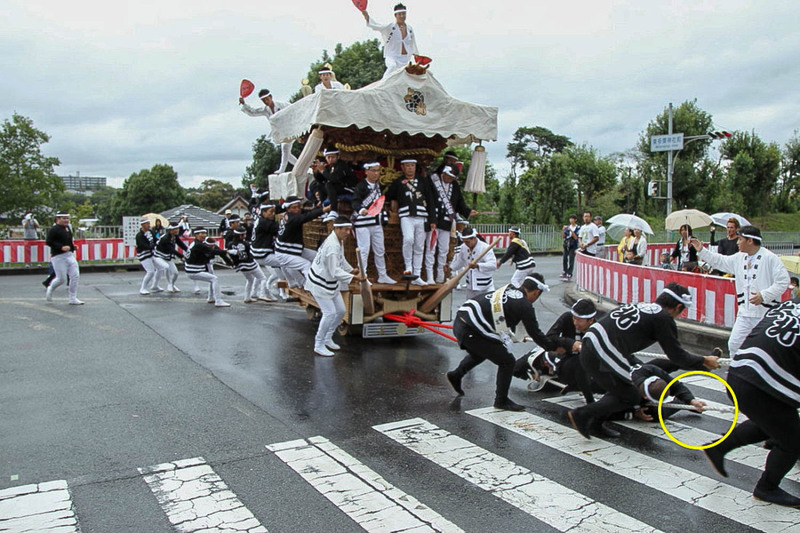 As the rope is pulled, the menbers which "making the arc" is to be directed to the right direction, as a result, only left members of Tsunamoto will not be completely maintain the arc. 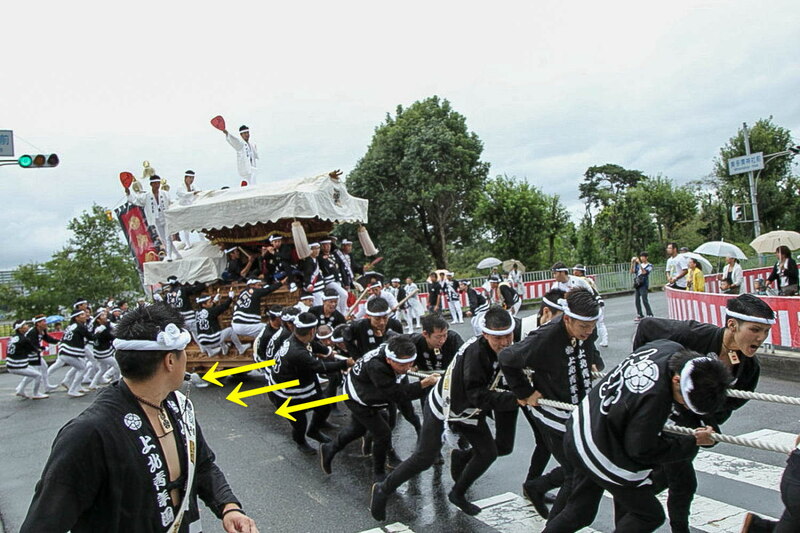 In this timing, Tsunamoto takes advantage of its power, Apply pressure to Danjiri, to bow in the opposite direction. 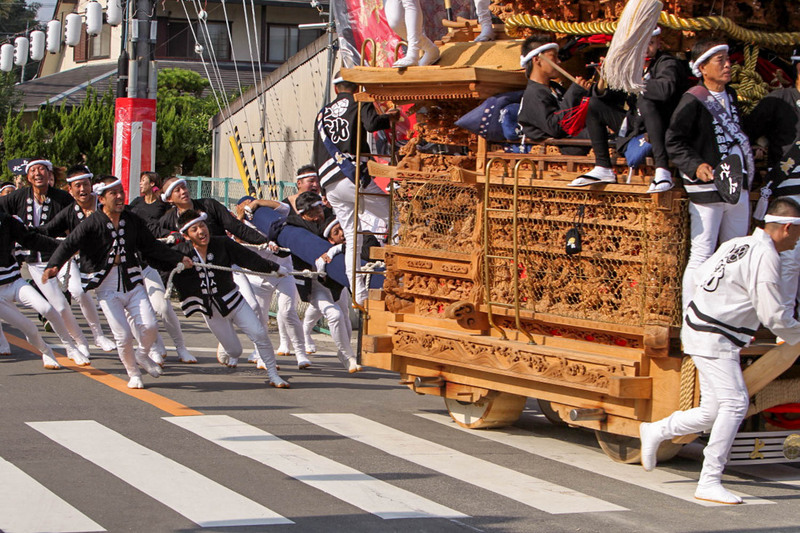 As a result, the force acts Right direction in front of the Danjiri, and the force acts Right direction in Ushirodeko, these are working synergistically, and Danjiri will be changing the direction at high speed. 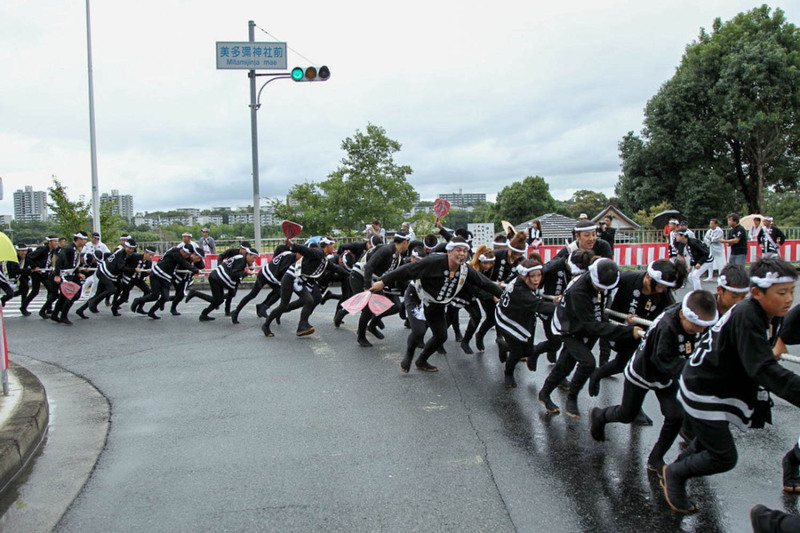 At this time, because Members of Tsunamoto would be swayed side to side with a large force, They will be blown away by lose balance a little. 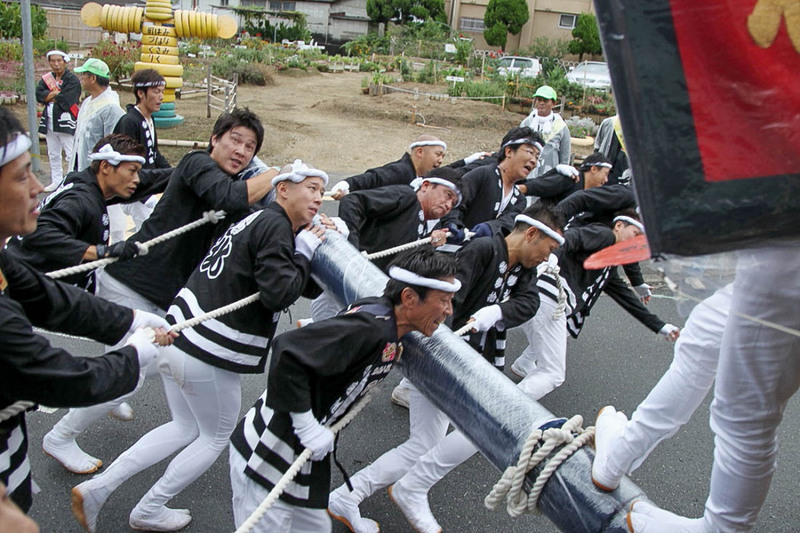 In this time, if hold the rope firmly, Can move as it is dragged by, but if would release the hand, will be occurs danger that run over by a Danjiri that are imminent in the back. 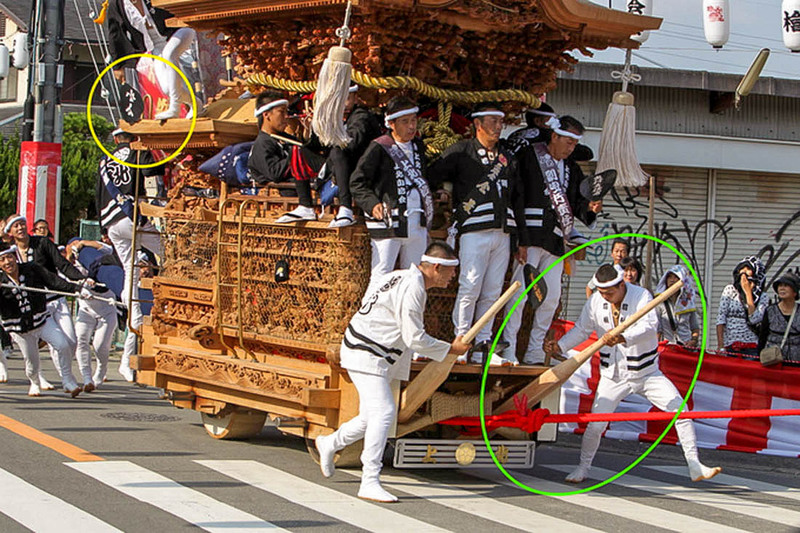 So case of Tsunamoto, then If they tipping, it is safer as be dragged, it is reason that also there is wheel through the wrist in Tsunamoto. 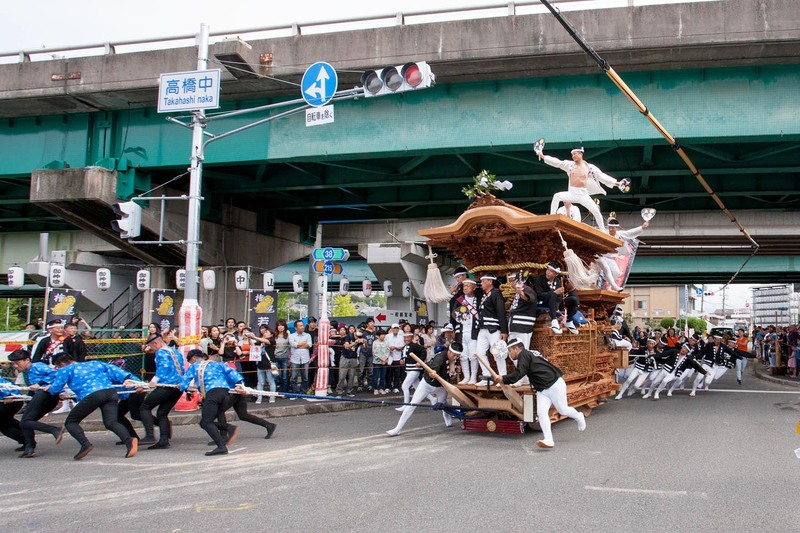 In the case of Danjiri, because the people in the roof is jumping, if applying the brakes at the moment when the people of the roof has to jump, will be occur the risk of fall in the forward by inertia. So, it is not so simple. that "Press the brake pedal soon if feel Danger". 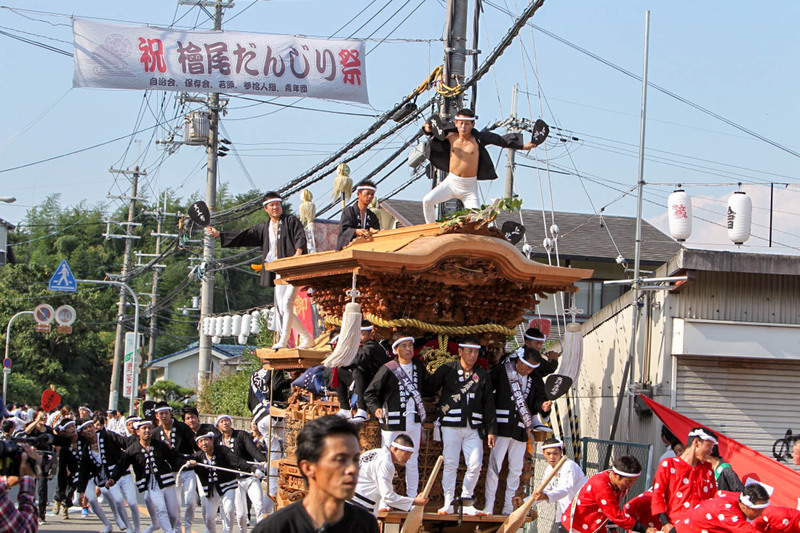 Brake responsible person, if the direction of Danjiri is shifted, and Even as the utility pole was looming in front of the eye, not be able to change the direction by himself like a car. In this case, the basic is to believe that "Ushirodeko to change the direction", however, as previously described, If nearly half of Ushirodeko members have gone missing at this point, not enough the number, and direction fix is be impossible. Brake engagement do not known the situation that "whether members of Ushirodeko are aligned" at that time. Without going the brake that believe "Ushirodeko us to change the direction", But if Ushirodeko members have been thrown off at that time, Collision on a utility pole unable direction correction...will result in. It might seem that "Why not brake sooner??" if look from near. But if stepped on brake each time in little things, it mean would be to waste "Post do not trust the lever" and "effort of Tsuna". So, might also lead to the fact that in many ways that "Step on the brake = Put a brake on overall unity". 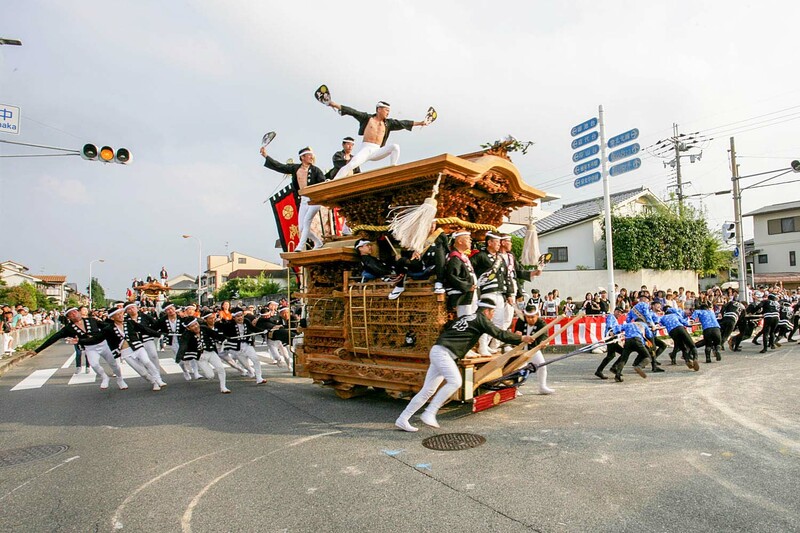 So, it is one of the fundamental attractions of Danjiri that "how are run through without going through brake", and Brake responsible people is the most important role that extreme perseverance and judgment is required. 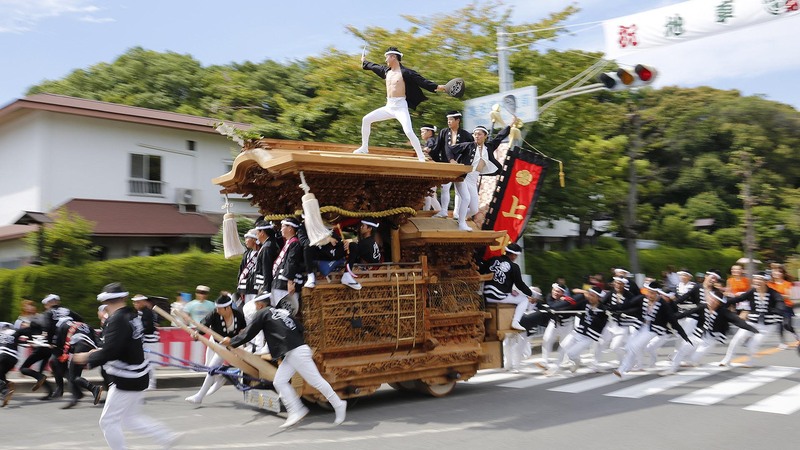 The People who able to grasp the overall situation of Danjiri while driving is Always Nobody. Finally Danjiri will run decent. 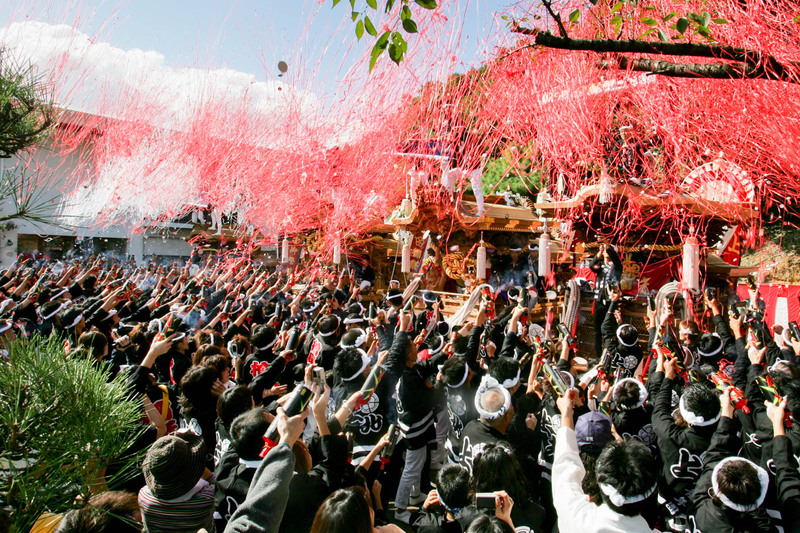 Why everyone rejoice so much when Yarimawashi was success? 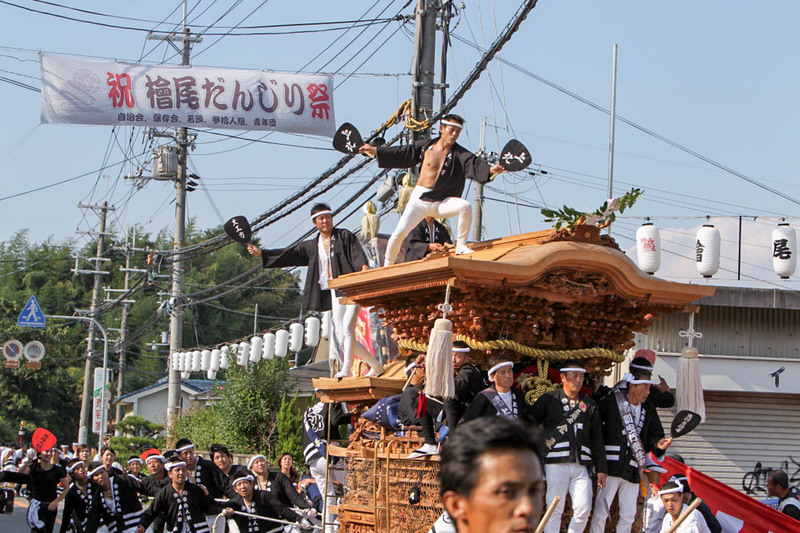 To take a look with understand why, will be more enjoyable Danjiri festival.